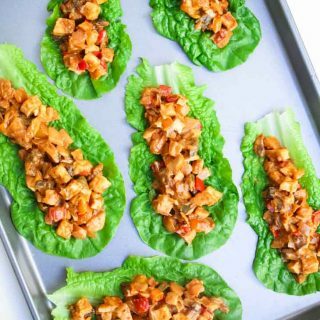 Make these Tofu Peanut Lettuce Wraps your next weeknight meal at home instead of ordering take-out! Easy prep, one-pot, quick sauce, simple clean-up! Cut the tofu into small cubes. Using a non-stick pan , pan-fry the tofu cubes on medium-high heat with 2 teasp oil. Gently mix and turn frequently until all the water is burned off and the tofu is lightly golden brown on most sides. If you find that the tofu is sticking to the pan, add a little more oil or turn down the heat. Once the tofu is pan-fried, put the pan-fried tofu in a bowl and set aside. While the tofu is cooking, continue with the recipe to prep all the veggies. Dice all the onions, bell peppers, mushrooms, and water chestnuts (I love using my Chop Wizard , quick and uniform in size). Once the tofu is done and set aside, add another 2 teasp. cooking oil to the same pan and heat on medium heat. Add the garlic and fry/saute for a few seconds until fragrant. Add all the diced vegetables (onions, bell peppers, mushrooms, and water chestnuts). Cook on medium-high heat, mixing frequently, until all the vegetables are cooked, yet still remain tender, and most of the water released from the vegetables has evaporated. While the vegetables are cooking, prepare the sauce. To prepare the sauce, add all the ingredients into a bowl and whisk. If you find it difficult to mix in the peanut butter, warm the water before you add it. Once the vegetables are cooked, yet tender, add in the pan-fried tofu and pour in the prepared sauce. Mix and combine everything together making sure all the tofu and veggies are coated in sauce. Cook on low-medium heat for a few minutes until you see the sauce start to reduce, thicken, and coat the veggies and tofu. Add in some chili sauce if you prefer spice and turn the heat off and set the pan aside. The filling can be hot/warm or room temperature (I prefer room temperature or slightly on the cooler side). Place some of the filling along the center of each large romaine lettuce leaf and serve. If your romaine lettuce leaves are thin, feel free to double up prior to placing the filling inside (this is what I did since my leaves were home-grown and on the thinner side). When you're ready to eat, slightly fold over both sides of the romaine leaves (like an open-ended burrito on both sides), and enjoy! To make sure these are done in the time stated, be sure to follow the instructions and multi-task when you're waiting for things to cook. Romaine Lettuce: I doubled-up (i.e. layered and used two leaves for every lettuce wrap) since my romaine lettuce was home grown and slightly on the thinner side. Therefore, I ended up using 24 lettuce leaves inside of 12. But for most of the store-bought ones, you should be fine using one leaf per wrap. Prep-ahead Tip: Make the filling the day before, or dice and prep all the veggies ahead of time. Toddler-Tip: If they have trouble holding the lettuce wraps, opt to tear the lettuce leaves and mix it into the tofu mixture and enjoy with a spoon instead!